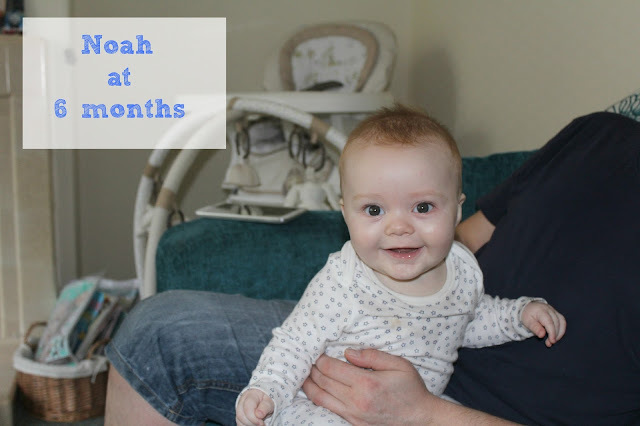 How has half a year past since I wrote this post introducing my little Noah Reve?! Looking back on those photos I expected to miss having that snuggly little newborn, but actually I'm far happier now you're at this stage - I'm not sure if I`m supposed to admit that but as fast as the newborn stage flew past with you I was pretty glad to see it go - I found it harder this time to bond with you as a brand new baby, maybe it's because we had your brother around distracting us and the only real interaction with you seemed to be feeding and changing you...but once you reached around 8 weeks old your personality started to show through and NOW...now you are a bundle of personality! 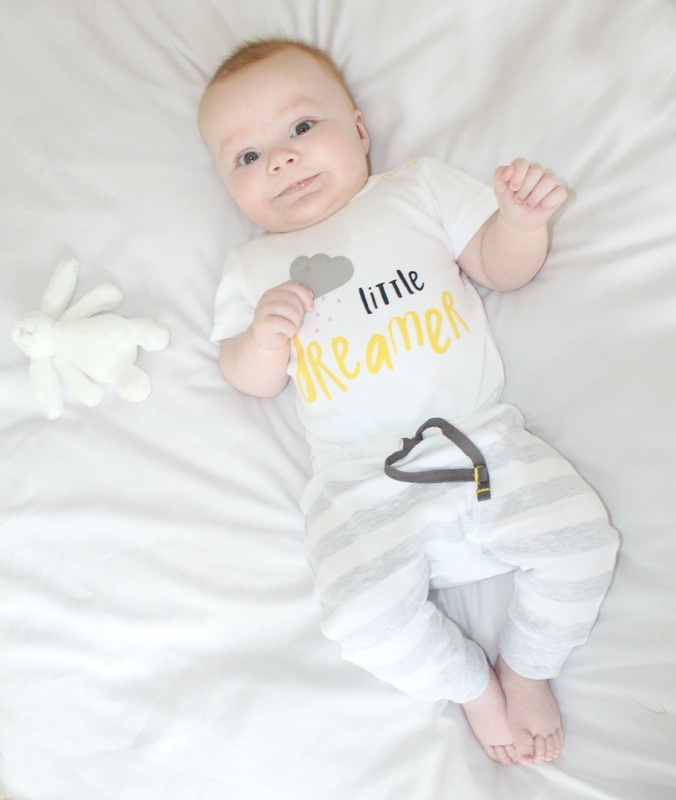 It's so easy to see the person you are now, and your eyes are always glistening with mischief - I think you're going to be quite a handful as you get older Noo Noo! You just love to play and cuddle - whenever I talk to you or pick you up you make this hilarious grinning face, and immediately try to grab my face and nuzzle yours into mine - it's so cute and so hilarious! When I ask you "Shall we dance?" you reach out and grab my hand and laugh when I start to dance you around, and when we ask you for kisses you open your mouth wide and lean forward. 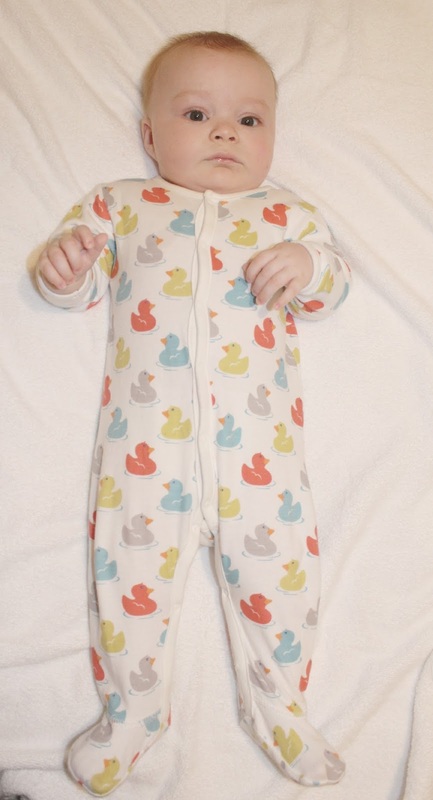 You are ALWAYS smiling, laughing and cooing away - you're the happiest little guy! 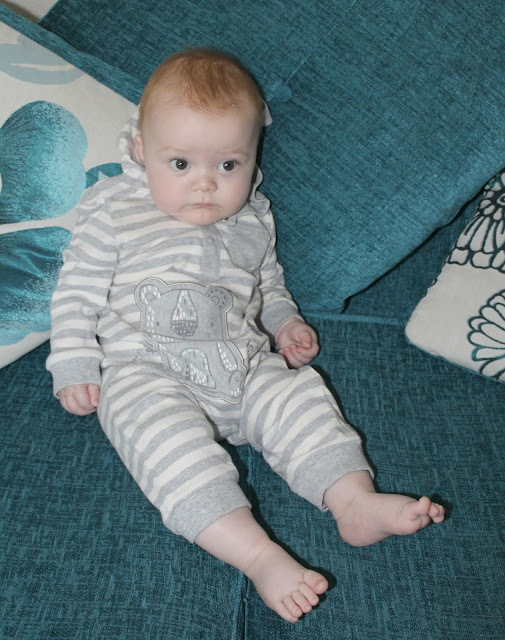 This evening you've started to really try to play with your big brother, the two of you seemed to devise a little game between you - as Tyne leaned over you in your chair as he always does you grabbed his dummy out of his mouth and stuck it in yours, Tyne said "HEY!" and grabbed it back and then the two of you fell about laughing - you kept doing it over and over for about 10 minutes, it was the most we've ever heard you laugh and you HAVE such a dirty old belly laugh, you sound like an old man! It's so funny! 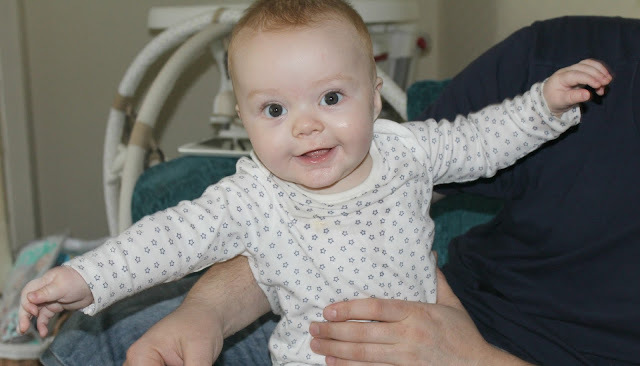 You're doing so well with your solids now, we're doing the traditional weaning method with you instead of baby led so you have purees for breakfast, lunch and dinner and usually have a yoghurt after dinner too - you pretty much always wolf them down, and you love the occasional rusk too! 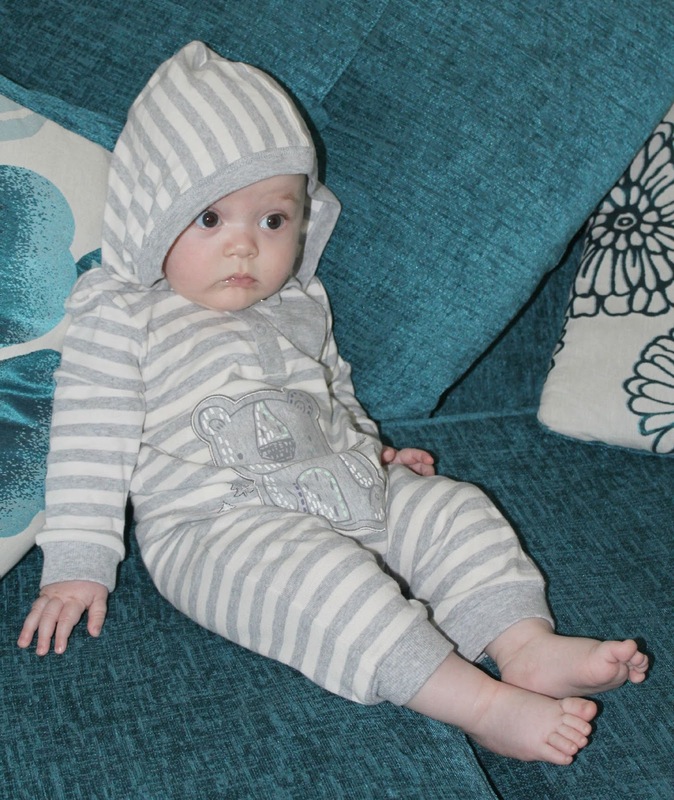 You're still drinking 6 oz bottles, and wearing size 2 nappies but I think it might be time for size 3's soon. You've just gone into your 6-9 month wardrobe, though some of your 3-6 still fits. You've gone very long lately though, so its no surprise you're growing out of things! Yesterday we noticed that you've cut your two bottom teeth at once! 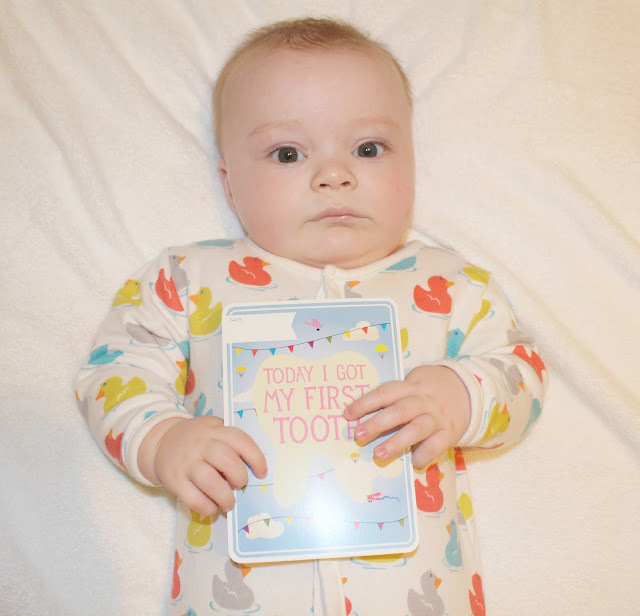 I was so surprised to find them in there as you have barely made a peep, so we had no idea you were teething other than all the drool! You're still sleeping through the night from around 8pm until around 8 am, this evening was your first night in your own bedroom - so far so good, you've been down for 6 hours with no stirring so far! I'll be sad not to have you next to me tonight as you've been in your Co Sleeper up until now, but I think you'll appreciate being in your own room as your brother often disturbs you when he comes through to our bedroom so you need the peace and quiet! Wow, he's certainly a good sleeper, and he looks so long in that gorgeous cloud sleepsuit. They grow so fast. I can not believe my child is 7 allready i miss my baby girl! Enjoy each moment and stage! Motherhood is so precious and such a wonderful opportunity! Aw Noah is so cute, hold onto your precious moments with him because it won't be long before he is a cheeky man vying for your attention! It seems time goes by so quickly! Noway is Noah 6 months old already. He is such a little cutie pie. 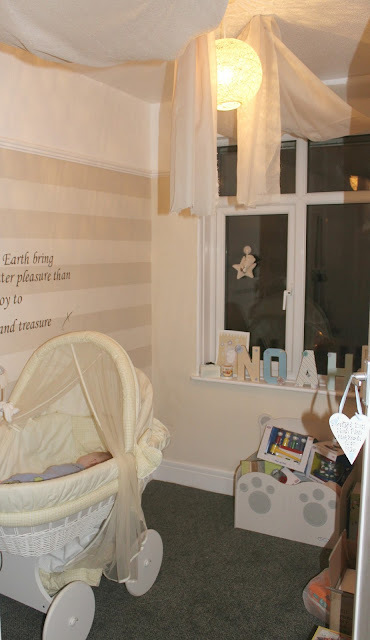 His room is adorable too :D His cot is perfect.